PARIS, FRANCE – The CIRCOR Aerospace Products Group, a business unit of CIRCOR International (NYSE: CIR), has been selected by Astrium, an EADS company (Paris: EAD.PA ), to provide Latch Valves for the Pressure Control Assembly on the tank pressurization system (PCA) on the re-ignitable upper stage EPS aboard the Ariane 5 expendable launch system. 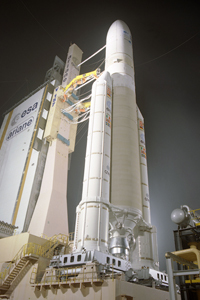 The latch valve is a critical fluidic controls component contributing to the success of the Automated Transfer Vehicle (ATV) mission, boosted by the Ariane 5 launcher. The ATV provides logistic support to the International Space Station (ISS). “The CIRCOR Aerospace team in France is proud to be a key partner to Astrium and support to the European Space Agency (ESA) and the Centre National d'Etudes Spatiales (CNES),” said Gilles Genété, General Manager for CIRCOR Aerospace France. Industria has an accomplished history of providing Space Latch Valves for mission critical hydrazine applications. Industria S.A.S. is a CIRCOR Aerospace company located in Le Plessis Trevise, near Paris, which designs and produces a full range of valves including solenoid, solenoid actuated, motor operated, and manifold systems for exacting hydraulic, fuel and pneumatic functions. Industria products can be found in servo-controls, landing, braking, steering, door actuation systems and various fluid systems on defense and commercial aircraft, ships, launch vehicles and automotive racing vehicles.